The draw for the second round of the FA Trophy has given Bognor the prospect of a team against a side from the top division of the non-league. The Rocks will be at home to Altrincham, currently 18th in the National League’s top flight, or Leamington, from the Southern League premier, in the last 32. Althrincham have an impressive cup scalp to their name this season - they beat Barnsley 1-0 in the FA Cup before going out to Colchester. 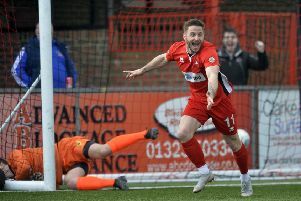 Eastbourne Borough will be at home to AFC Fylde, who are second in the National Lerague North, or Skelmersdale from the Northern League premier division. Both sides reached the last 32 with superb first-round wins on Saturday. The Rocks won 1-0 away to National League South high-flyers Maidstone while Eastbourne Borough enjoyed an amazing goal-feast - beating Hemel Hempstead 7-4. Both clubs earned £5,000 for those round-one wins and can look forward to a £6,000 payout if they win again at the next stage, which is due to be played on Saturday, January 16.